The reason why I’ve waited so long is that I wanted it to be really good. I’m sure I’ve read most of the khachapuri recipes ever published, and I’ve tried a good dozen different formulas. I also had to make my own cheese, which took yet more time to perfect; I’ve posted my takes on Imeretian cheese and sulguni recently. According to Tinatin Mjavanadze’s Georgia with Taste, the cheese should be only Imeretian, so that the khachapuri still tastes good when you eat the leftovers cold. A bread made with sulguni would have the texture of cold pizza, and many people don’t like that. I’m not a supporter of leftover bread, but the goal is still commendable. I’ve made sure my khachapuri’s still great when eaten cold, although I’ve found I can achieve this while still using some percentage of sulguni. In the Cookbook of the Soviet Peoples, khachapuri is described as a baked good “with high cheese content”. Pokhlebkin suggests a cheese-to-flour ratio by weight around 2:1, and my formula’s pretty close to that — I use slightly more cheese, even! Yes, it does take an awful lot of cheese to make a khachapuri. I’ve “discarded” (read: forced myself and my family to eat) countless versions that were too doughy. Since it’s such a staple, there’s the idea that one should be able to prepare khachapuri quickly if need be. My recipe is indeed quite easy, with a yeast-free dough that contains matsoni (Georgian yogurt), another must-have ingredient. You don’t really have to make your own cheese; a blend of feta and mozzarella works quite well (more on this another time). As far as I’m concerned, a good khachapuri should reach what I call the fat saturation point, both in the dough and the cheese mixture. Add more butter to the dough, and it will become too soft. Add more cheese, and you’ll start seeing drops of grease in your cooked khachapuri. The proportions below strike just the right balance. Place the yogurt and eggs in the bowl of an electric mixer fit with the paddle attachment. Add about 2/3 of the flour with the salt and baking powder, and mix over medium speed until homogeneous. Add the butter and the rest of the flour, and mix again. Remove the bowl from the mixer, and knead the dough by hand for about one minute. Cover with plastic wrap, and refrigerate for 30 minutes. Preheat the oven to 450 F, and place a dish full of water on the bottom rack. Slice the Imeretian cheese and sulguni. In a bowl, crumble both cheeses between your fingers. Season with black pepper, and adjust the salt level if necessary — the mixture should taste quite salty, but still be edible! I use an extra 1/4 tsp with my homemade cheeses. On a floured surface, roll the dough to an 11″ diameter disc (the shape doesn’t need to be perfect at this point). If you’re a perfectionist, make the edges a bit thinner. Place the cheese mixture in the center. Fold the dough over the cheese, just like you would wrap something in a hankerchief. Make sure the overlaps are minimal, otherwise you will end up with some very doughy areas. Flip over, and gently roll back to an 9″ diameter disc. 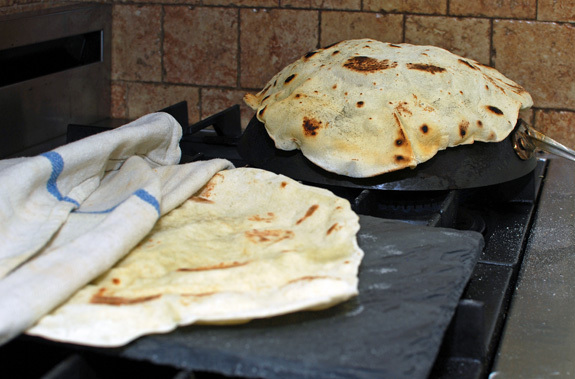 Transfer the khachapuri to a baking sheet lined with a Silpat or parchment paper. Mix the egg yolk and water in a cup, and brush the dough with the resulting egg wash.
Bake in the oven for 18-20 minutes, until the top is golden brown. Let cool 5 minutes, then serve. In Hungary, whether you’re at the market, at the train station, on the beach or just walking down a commercial street, sooner or later you will smell the bewitching greasy invitation of the lángos, the ubiquitous Hungarian deep-fried flat bread. You might even encounter this fat-soaked snack in neighboring countries like Austria, Germany, Czech Republic, Serbia, or Romania. The name comes from láng, the Hungarian word for flame. […] [The] ancestor of flat breads was the panis focacius attributed to the Romans (of which derives also the Italian flat breads called focaccia). 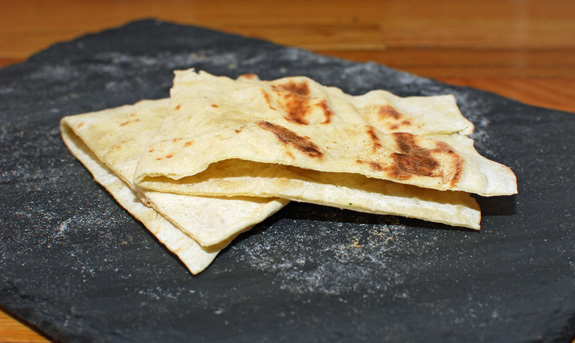 In ancient Rome, panis focacius was a flat bread baked in the ashes of the fireplace (cf. Latin focus meaning “fireplace”). However, the modern lángos, despite its name, is not prepared near an open flame but rather by deep-fat frying, and among Hungarian foods it is instead the pogácsa which preserves the connection, both etymological and culinary, to the ancient panis focacius. There’s still a gap in the story, though, since the Romans and the Magyars never actually found themselves in the same place at the same time. The Hungarian tribes lived around the Ural Mountains until the 8th century, while the Roman Empire had disintegrated in the 5th century and hadn’t expanded much farther East than the shores of the Black Sea. The link may just be the Magyars’ invasion of former Roman Pannonia (modern-day Hungary), where some Roman customs and cuisine must have lingered. Anyway, let’s get back to the lángos. It’s usually eaten as a snack. The toppings of choice are grated cheese and sour cream, but there are many variations. Ham, sausage, cabbage, mushrooms, quark, and butter work great, as well, and you can even make a stuffed version with some of these ingredients. For those of you who would prefer a lighter option, I’m also giving a recipe for the original baked lángos. Though totally different from the fried version, it’s a pretty good bread. Feel free to top it with garnishes, or use it to make sandwiches! Place the potato in a pot of water, and cook over medium heat until very soft. Mash the potato, and measure 5.3 oz. Dilute the yeast and sugar in about 1/3 of the milk, and let rest for 10 minutes. Sift the flour into the bowl of an electric mixer fit with the paddle attachment, then mix in the salt. Mix in the yeast mixture and the rest of the milk on low speed. Add the butter and the mashed potatoes, beat for another minute, then cover with plastic wrap, and let rest for about 1 hour. Divide the dough into 6 parts. 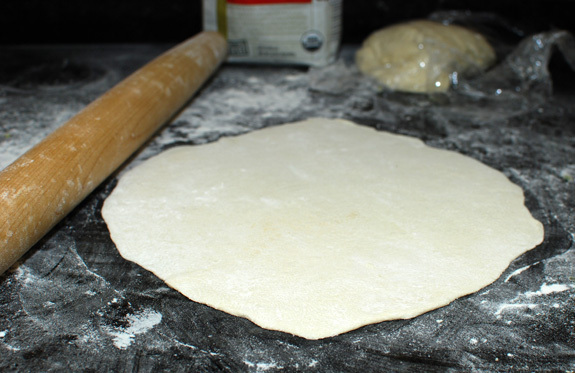 Using a rolling pin, roll each lángos into a 5″ x 7″ oval, about 3/8″ thick. If you want the bread to have an airy crumb instead of just tasting like an oily mess, it’s important to aim for an even thickness (no thin spots). Heat the oil to 375 F in a deep-fryer. Here again, make sure to really wait until the oil is hot enough to limit the amount of fat absorbed by the bread. Deep-fry each lángos until golden brown on both sides, flipping it only once if possible. Drain on paper towels, add toppings, and serve immediately. over with plastic wrap, and let rest for 30 minutes. Bake the lángos in a 450 F oven for 5 minutes, Brush the tops with olive oil, then bake for another 5-7 minutes, until golden brown. Remove from the heat, transfer to a cooling rack, and let cool. Once again, Orthodox Easter came and went, and I didn’t have the time to finish my kulich recipe on time. At least now I’ll have it ready for next year! A kulich is a kind of Easter bread, somewhat similar to a panettone, but usually denser. 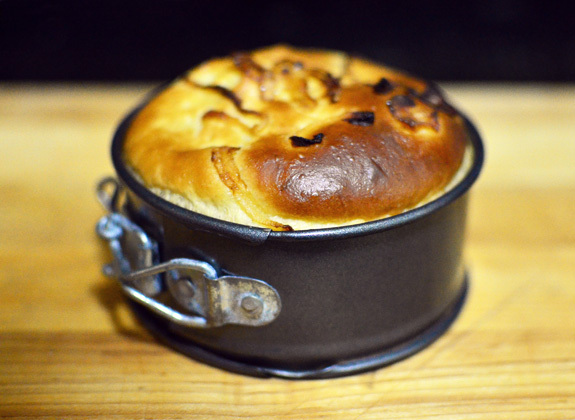 Just as with panettone, you’ll find many different recipes with varying degrees of richness. On one end of the spectrum, the more bigoted recipes consider it sacrilegious to have too much of a good thing, and therefore result in something that’s still close to plain bread and pretty dry. On the other end, the better recipes from the most reputable sources tend to resort to common tricks for achieving sinful dessert decadence: push the amount of butter to stratospheric levels, and liberally add more egg yolks, more sugar, more fruits. My rendition belongs, of course, to the latter category. It distinguishes itself by the variety of dried and candied fruits I’ve chosen, to reflect the diversity found on Russian markets, and by the use of saffron, in accordance with traditional kulich recipes that recommend the use of a dominant spice (other possibilities include cardamon and cloves). I also serve it with a rum-raisin crème anglaise. When I started working on the Salmon and Pork Belly Burger, I thought making a good potato bun would be a no-brainer. After half a dozen trials and several pounds of patties, I acknowledge the task was harder than it seemed. Though I won’t name names, the commercial potato rolls I’ve looked at are a bit of joke, as they use about as much potato flour as yeast (understand: not a whole lot). Check the labels yourselves! The main ingredient is wheat flour, and food coloring does the rest. There aren’t any eggs either, so that oh-so-potatoey yellow color is 100% Yellow #5, or 6, or whatever. Well, take THAT, messieurs Nathan Myhrvold and Heston Blumenthal! My potato bun, though inspired by your recipes, can be ready to eat in under 3 hours, and it tastes pretty damn good. The knish, a kind of stuffed bun, has an interesting history. It originated in Ukraine and Belarus, where it was known as knysh and was a kind of pirozhok usually filled with buckwheat, onions or bacon. However, it almost completely vanished from the culinary repertoire of these two countries, and it was instead brought to America by Jewish emigrants at the beginning of the 20th century. It became a Jewish staple as a round bun filled with either potato or buckwheat. I thought it was time to transform the potato knish once again. My version is unorthodox, but delicious! For the potato filling, I adapted Heston Blumenthal’s recipe for potato purée, and the dough is a choux dough mixed with cheese, like the one used in gougères. The puffs are then partly hollowed out (you want to keep a bit of the pastry inside to make thinks more interesting) and the purée is piped into them. You can choose pretty much any melting cheese of your liking for the dough — I’ve had good results with Pecorino and various tomme-style cheeses. I eventually picked aged gouda for its nuttiness and because it’s somewhat similar to some cheeses made in Russia. Bring a pot of unsalted water to 175 F. Add the potatoes, and cook for 30 minutes, maintaining the water temperature at 160 F (if you use a lot of water and cover the pot with a lid, the temperature should remain almost constant without you doing anything). Transfer the potatoes to a bowl of ice water, and let cool completely. Bring the pot of water up to a boil and salt the water. Add the potatoes and simmer until cooked. Pass through a food mill fit with the finest disk; if necessary, use some of the sour cream to get the grinding going. Mix the potatoes with the sour cream, butter, black pepper and nutmeg, then push the mixture through a sieve — you can either pass it through a conical sieve with a ladle, or rub it through a drum sieve with a spatula. Reserve. 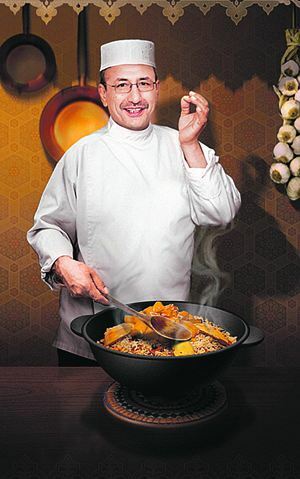 In a saucepan, bring the water, butter and a pinch of salt to a boil. Remove from the heat, add the flour and mix well. Put back on medium heat, mix until the dough does not stick, then keep stirring for about a minute. Drying out the mixture enough is essential for the gougères to puff properly. Remove from heat, transfer to a bowl, and add the eggs one by one, mixing between each egg. Add the cheese, pepper and nutmeg and mix well. Form small balls of dough on a sheet tray lined with parchment paper, and bake in a 350 F oven for 25-30 minutes, until golden brown. Transfer to a wire rack and let cool. 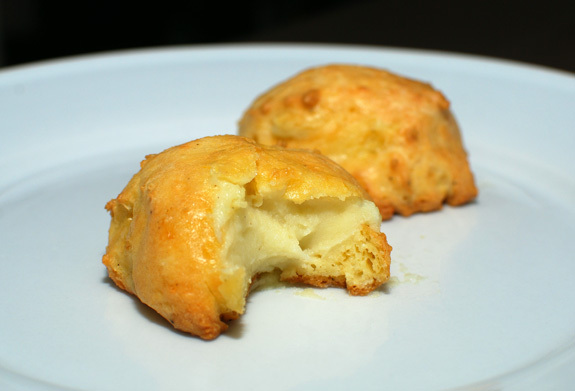 Make a hole at the bottom of each gougère using a pairing knife, and carve most of the dough (but not all) out of the puffs. Do your best, but don’t worry if you puncture the top of the gougère or end up with a large hole at the base, the result will still look and taste great. 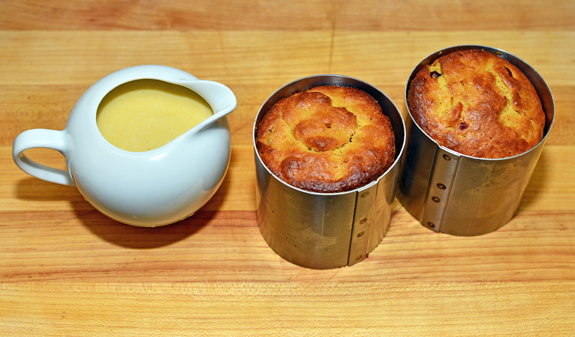 Fill a pastry bag with the potato purée, and pipe into the gougères until they start plumping up. Place on a sheet tray lined with parchment paper, and reheat in a 350 F oven for about 8 minutes. Serve immediately. 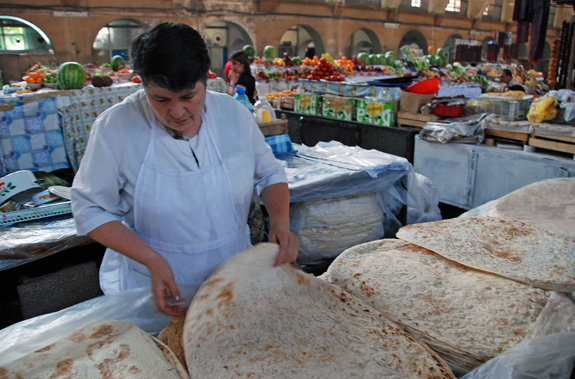 Wherever you go in Georgia, you can be sure to eat khachapuri at least once a day. 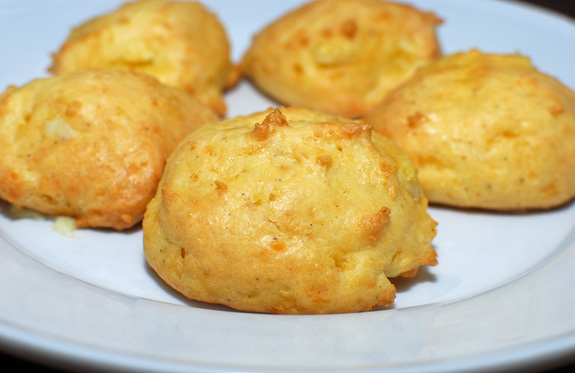 These national cheese breads come in various shapes. The Imeretian khachapuri is a round pie filled with cheese, by far the most common. The Mingrelian one is similar, but topped with more cheese. The cheese is usually whatever is produced locally, from curds to sulguni, fresh or aged. Don’t call it Adjaran there though — you might get shot in the head! Locals have renamed it “lodochka”, “little boat” in Russian, which is particularly funny when you know that the only boats you’ll see in Abkhazia are Russian war ships.